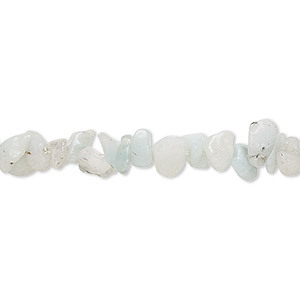 Bead, larimar (natural), medium chip with 0.5-1.5mm hole, Mohs hardness 4-1/2 to 5. Sold per 15-1/2" to 16" strand. Item Number: H20-9999GS Have a question about this item? A recently discovered, rare gemstone found in the Dominican Republic, larimar is also known as "dolphin stone," the "Atlantis stone" and as the "Caribbean gemstone" for its captivating ocean-blue color. Named after the daughter of the mine developer who discovered the stone, larimar is a combination of "Larissa" for the daughter and "mar," the Spanish word for sea. Mottled white patterns and iron oxide plumes range from semitransparent to opaque. 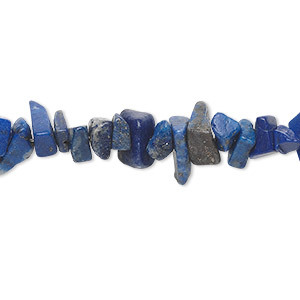 Bead, lapis lazuli (natural), medium chip, Mohs hardness 5 to 6. Sold per 36-inch strand. 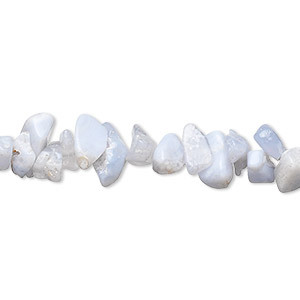 Bead, blue lace agate (natural), medium chip, Mohs hardness 6-1/2 to 7. Sold per 16-inch strand. 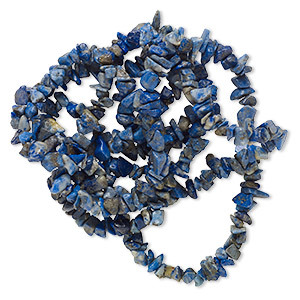 Bead, blue tigereye (natural), medium chip, Mohs hardness 7. Sold per 15-inch strand. Minimum 2 per order. 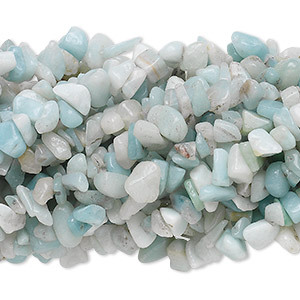 Bead, amazonite (natural), medium chip, Mohs hardness of 6 to 6-1/2. 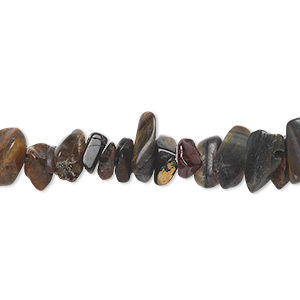 Sold per 36-inch strand. 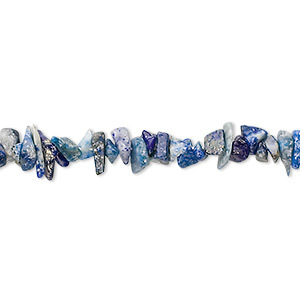 Bead, sodalite (natural), medium chip with 0.5-1.5mm hole, Mohs hardness 5 to 6. Sold per pkg of (10) 34-inch strands. 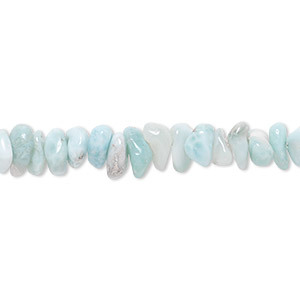 Bead, amazonite (natural), medium chip with 0.5-1.5mm hole, Mohs hardness of 6 to 6-1/2. Sold per pkg of (10) 34-inch strands. 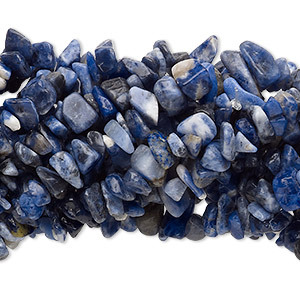 Bead, denim lapis (natural), medium chip, Mohs hardness 5 to 6. Sold per 36-inch strand. 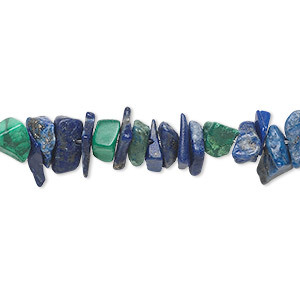 Bead, lapis lazuli and malachite (natural), medium chip, Mohs hardness 5 to 6. Sold per 36-inch strand. 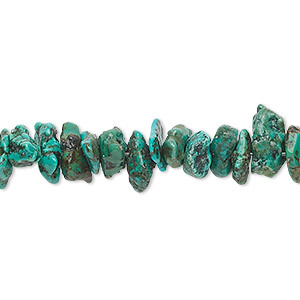 Bead, turquoise (dyed / stabilized), blue-green, medium chip, Mohs hardness 5 to 6. Sold per 15-1/2" to 16" strand.